Thanks to everyone who had a guess at last week’s mystery cards. Most of you came very close indeed! 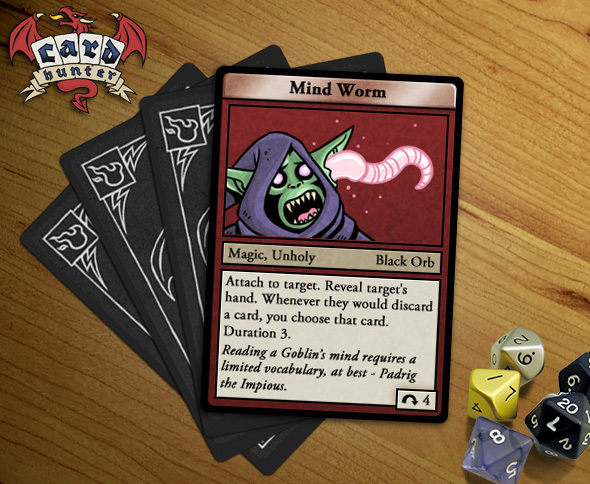 Special shout out to Pugs and thebangzats whose guesses included one exact card name correct (“Mind Worm”) and very close guesses for card function on most of the cards. Mighty Mushroom also got an exact match on a card name (“Slippery”) and good guesses at the cards’ function as well. But, actually, almost all the guesses were pretty close, which I think indicates that our art team (well, Ben, for all these cards) has done a great job at drawing pictures that are indicative of the cards’ actual effect. This is actually a pretty new card and I haven’t had a chance to play with it yet, but it looks pretty nasty to me. Of course, it’s entirely dependent on how much your opponent is forced to discard and how much they can play out their entire hand each round. I’m guessing it would be good in an evasive Elf deck where you can stay out of range, forcing your opponent to discard and then making them throw away their most powerful cards. It’s a bronze card, so we evaluate it as being good, but not super-powerful. OK, this is going to need some explaining. What exactly is a black card? The answer is that Black cards are Traits. Traits are special kinds of cards for four reasons. The first feature of a trait is that you must play it before you play any other card. So, if you have a trait in your hand, you can’t play anything else that isn’t also a trait. Secondly, you can’t pass while you have a trait in your hand. The result of those two rules is that, naturally, traits get played when you draw them (or when it is your turn, anyway). The third feature of a trait card is that playing it doesn’t end your turn. Normally, your opponent gets to play next after you play any card but traits don’t cause that to happen. The final feature of a trait is that when you play it you immediately draw another card to replace it. The net effect of these rules is that when it is your turn, you have to play out all the traits in your hand and then you get to play one of your remaining non-traits. Normally, you’ll play out all your traits at the start of each round but, of course, sometimes you draw some during the round as well. Sometimes playing a trait causes you to draw another one, churning through your deck. No, it isn’t possible to build a deck of nothing but traits! We have traits in the game for a couple of reasons. One is that they are a way of expressing features of a character or monster that aren’t positive. 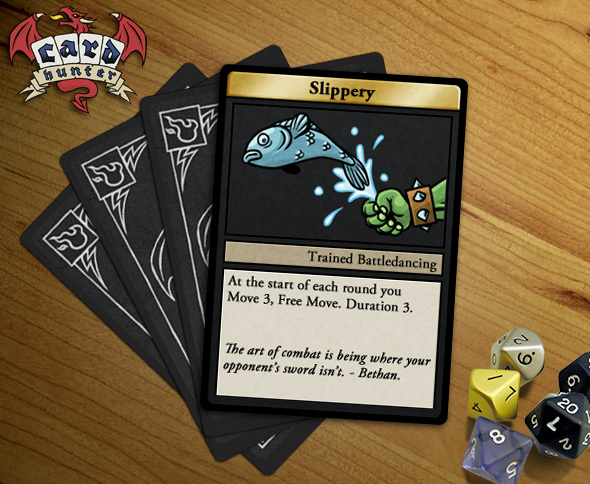 That’s not the case for Slippery, but it is for a lot of other traits. For example, there’s are traits called Trip and Flammable. I’ll leave you to figure out what they do. If these cards were in your deck and weren’t traits, you’d just never play them. Another reason for traits is that it lets us express minor features of a character that wouldn’t warrant inclusion in a deck at the full “cost” of a card. Take a look at the other trait previewed below for an example of that. Anyway, Slippery is clearly a pretty good trait. You’re basically going to get three moves out of it – but those moves are spaced out over three rounds and don’t happen until the start of the round after you play the trait. But, you do get all of that and a replacement card, so it’s clearly pretty valuable – hence the gold title bar. Luckily, we’ve already discussed terrain altering cards, so I don’t have to explain that now :-). 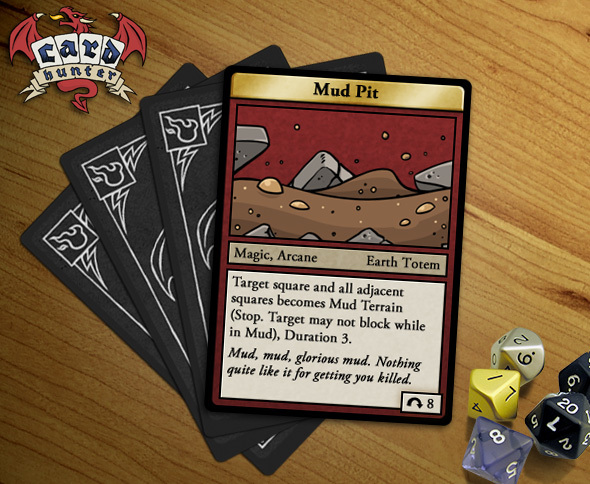 Mud Pit is clearly a pretty nasty card for bogging down your opponent and also getting past their blocks. Perfect for sneaky wizards who want to hang back and shoot their opponents from range. Now you just have to figure out a way around their armor. Here’s another trait! And it’s another beneficial one. I’ll have to make sure to preview some negative traits in the future. 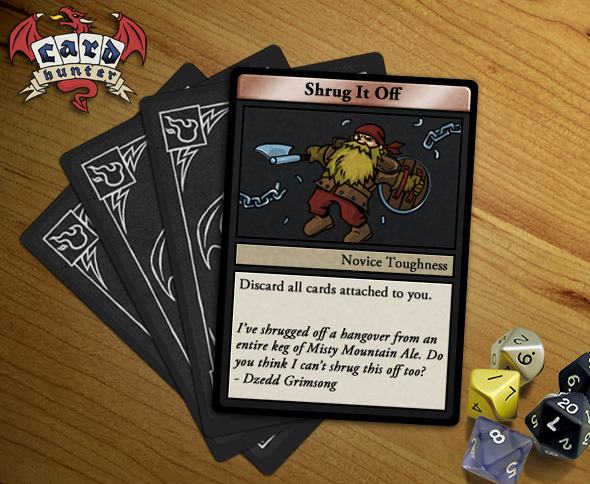 Anyway, this is obviously a dwarf card that let’s you get rid of annoying attached cards that are causing effects like poison, burning and so on. Pretty handy, but the fact that you have to play it when you draw it stops it from being super powerful. Nevertheless, it’s a bronze card by virtue of the fact that it gets replaced when you play it. Finally, check this card out – our first dual color card. It’s red and white because it’s both helpful and harmful (technically, it’s an attack and an assist). I’m sure you can see all the interesting ways that this can be used. It nets a total of 2 damage to the target over it’s lifetime, so you can use it to finish off wounded enemies – if you can wait out the duration. Alternatively, it can be used to prop up an ailing ally if you are close to winning but just need a little more temporary health for the rest of the round. 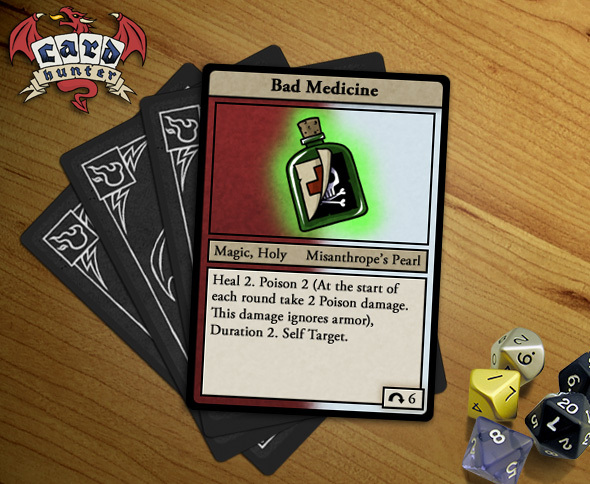 And, of course, if you are casting it on a dwarf and want to chance them drawing a Shrug It Off next round, you may get the 2 healing without the poison effect. Now, admittedly, those effects are tricky but not super powerful so this just has our base paper colored title bar. The Self Target keyword indicates that you can play this card targeting the instigator (the same character you played it). Attacks can’t generally do that (you can’t stab yourself) and it can be very handy in some situations. Anyway, I hope you enjoyed that big burst of card previews. Next week I think I’ll move on to discussing our talent system! Ditto on awesome. The previews continue to show neat little tricks that will making choosing a deck lots of fun. In the terrain altering blog, Consecrate Ground and Acid Pool are both purple cards. Is there some significance that Mud Pit is red, or am I just looking too hard? I’ve said it before and I’ll say it again. Shut up and take my money!! Can’t wait to play this game! A gameplay video or more game screens would help the wait until release. cheers! Looking good, still excited for this game, when is it going to be out? @mightymushroom: yeah, we’ve been mucking around with the card colors. In the past, we distinguished between spells (purple) and regular attacks (red). We’ve decided to make all attacks red and all assists white so Consecrated Ground is now a white card and Acid Pool is red. @eddy: We know we need to get you guys a video showing how the game actually plays. Just waiting on getting some decent audio into the game. How would a card like Mind Worm work against minion monsters? Is it attached to the whole group? If so, would a cleansing effect used on a group of minion monsters cleanse all the remaining minions? Or do you attach it to one but allow it to see the whole group’s hand? In which case you’d have to hope not to kill that particular minion or you’d lose the effect. Good question Pugs. Mind Worm would be attached to an individual minion but it would take effect on the whole group (since they have a shared hand). Killing that minion would indeed cancel the effect on the whole group. How many campaigns or adventures will ultimately be in the game? Also from either a video game perspective or otherwise (i.e. Dungeons and Dragons or something along those lines) what would you say first made you want to get into video games and later, into this specific project? The more cards I see, the more awesome I know the game is gonna be. I’ll definitely be throwing some support behind this game! John – I’m not entirely sure yet but probably around 50-100 adventures. Maybe less on first release and then more post-release. John, with regard to your second question: this project was really born of a desire to do something different after working on first-person shooters for more than 10 years… not bad work but time for a change! I’m really really hoping for the same level of quirky fun in the adventures that the characters in Freedom Force expressed.